Countries worldwide are struggling to provide for the pension needs of their increasingly aging populations. Encouraging private provision is only part of the solution. Paying for retirement is an expensive business. As more people look to retire early, there are now few countries in the developed markets that are not facing the worrisome prospect of an increasingly aged population and the consequent demands on already overstretched state pension schemes. Even countries such as France and Germany, which have long prided themselves on the generosity of their state schemes, are having to look for alternatives to stave off a future funding crisis. In fact, all of Europe’s major economies are currently considering or are in the early stages of implementing fundamental structural reform to their state pension systems in order to address new funding challenges. The overriding theme is the encouragement, and in some cases enforcement, of private provision. Any change in this area will have profound effects on government funding requirements, fund managers and insurance markets, employers and, greatest of all, the individuals themselves. The changes are being driven by the realization that many of today’s workers will not have sufficient income to fund even a basic standard of living after they stop working. In Europe, which has an aging society, it is feared that millions of people could be at serious risk if governments continue with proposed reductions of state retirement schemes. Europe’s considerable cultural and political divisions inevitably mean there are many differing views on how best states should provide for their aging populations. Three facts are, however, widely agreed upon. Most states will shortly be unable to afford to adequately provide for their workers’ retirements; individuals appear to be failing to make suitable plans to fund their own retirements; and it is not possible to rely on corporations to provide long-term pension schemes that they also administer. Opinions differ sharply across the European Community regarding the magnitude of the impending pension crisis, but most countries admit that changes must be made—and made soon—if we are to prevent potentially hundreds of thousands of pensioners living in poverty. In deciding how best to solve this ever-growing problem, some are turning their attention to other countries that are further down the path of private pension provision and long-term savings plan reform. The United States, where personal provision revolves around the 401(k) plan, is the prime source of inspiration. The problem is far from just a European phenomenon, though. In a recent working paper entitled “Aging Societies and the Looming Pension Crisis,” the Organization for Economic Cooperation and Development stated that all its member states should reform their pensions schemes if they have not already started to do so. The OECD, whose members include Japan, the United States, South Korea, Australia and more than 20 European nations, doesn’t want countries to stop at pensions reform, however. It is urging its members to promote fundamental changes in behavior and attitudes in order to promote a longer working life. It is concerned that if working lives are not extended, then living standards of retirees and workers alike will fall. As the ratio of retired people to working-age people continues to increase, there will be fewer people to support more retirees. In countries that still rely heavily on state-funded pension schemes, which are dependent upon taxation for their funding, this seemingly unsolvable equation is at the core of the looming pensions crisis. In Europe, the initial response of many governments has been to squeeze the value of future state pension benefits in the hope that individuals will take the initiative and begin to save in order to top-up their potential future pensions. If they don’t, there is the very real prospect of retirees being left without sufficient income. So far the response has been distressingly unenthusiastic. Not only employees are turning a blind eye to their own retirement needs. Employers are also in some cases storing up problems for the future. In Europe and the US a large number of corporate employers, both large and small, have fallen behind on the level of funds needed to fund the retirement plans of their employees. This has led in several cases to extreme actions being needed and in a handful of cases has resulted in severe pressure being placed on earnings figures and long-term liquidity. Across Europe, governments are wrestling with solutions for their pensions underfunding. In each country the situation is slightly different, and the solutions they devise will have to account for those differences. Some of the key characteristics are described below. According to research carried out recently by the Association of British Insurers (ABI), only 4% of Britons are confident they will be able to live comfortably after retirement. The British may have a habitually pessimistic view of the state of their finances, but it would appear that in this case their pessimism is justified. JPMorgan Fleming discovered in September 2003 that 53% of people can expect difficulty in retirement, as they will have an income of less than 40% of their final salary. Despite strenuous efforts to encourage people in the United Kingdom to save for their retirement, the number of people storing up potential problems is growing, not decreasing. They can be in no doubt that the government’s help is diminishing, too. As well as planning to raise the state retirement age to 70, the government is trimming pensions: The state pension is set to fall to a mere 22% of earnings by 2050. Adding to the problem is the fact that the UK has the lowest average household savings rate in the developed European countries at 5.2%, compared to an overall average of 10.8%. It is generally accepted that people need between 70% and 80% of previous earnings to maintain an adequate standard of retirement living. Thus a great reliance needs to be placed on compulsory and voluntary private provision to top-up retirement income. Currently only 58% of eligible workers are members of an occupational pension scheme, while approximately 12% contribute to voluntary personal pensions. There is some overlap in this group, meaning that more than 30% of all workers are currently contributing nothing to their retirement above what is taken through taxation. Many of the 70% who do have additional pension schemes appear to be failing to contribute sufficiently. Recent reforms are aimed at solving this problem. Since 2001 all employers not already providing reasonable pensions must offer and assist employees in opening “stakeholder” schemes. These are much the same as 401(k) plans in that they are defined contributions schemes with ownership resting with the individual employee and are transferable in the event of a change in employment. The state pension fund provides among the highest average payments of any nations to its retirees. It is estimated that only 6% of pensioners receive less than 50% of median income. It is an extremely generous scheme—and it is extremely costly. Pensioners can receive as much as 70% of their final salary so there has been little incentive for individuals to consider supplementing their retirement income. With the rapidly aging population this is no longer considered sustainable. In a series of changes referred to as the Riester Reforms, the maximum replacement rate was cut to 63%, and it will be reduced to 45% by 2030. Very few Germans currently have either an occupational or a personal pension. Researchers at Mannheim University have calculated that the average German worker needs to save between 4% and 8% in order to maintain the standards of the current retirees. This is not currently happening. Those in Germany who are attempting to supplement their retirement incomes are generally opting for medium-term tax-favored products. But many of the products available for personal pension funding are overly complicated due to excessive government regulation, and until this situation changes, take-up looks set to remain low. Work is being undertaken to simplify private pension schemes and to remove some of the tax incentives afforded to the medium-term products. There are those in Germany who believe the pace of these reforms is dangerously slow. The situation in France is very different from that in Britain. The state pension provides a retirement income at 70% of earnings almost across the board after 37 years’ contribution. Both state-managed and employer-managed schemes are compulsory. The situation is different from most others countries in that French citizens save vastly aboveaverage sums for retirement through medium-term life assurance products. The French government is extending the contribution period to 41 years by 2012. Unfortunately, the French system places a heavy financial burden on the state. Under the current situation the French pension system will pass into deficit by 2009, so further rises in the standard working period are considered likely. Without further increases in the level of contributions, the level of benefit could fall to below 50% of salary. Even with the increases it is unlikely that the 70% level will be maintained in the long term. Given the likely decline in the level of the state pension and an extension of the average working life, the French government is working hard to promote voluntary personal pension schemes, partly by increasing the tax benefits for pension saving and removing some of those from the medium-term funds. Concerns have been raised in recent years about the large number of workers who have been left with serious pension difficulties as a result of corporate bankruptcies and pension fund failures. The large scale cases such as Enron and WorldCom in the US and Marconi and the Mirror Group in the UK have been well documented, but employees of smaller businesses are suffering, too. In Britain, United Engineering Forgings collapsed in 2001, resulting in many of its employees losing around 80% of their entitlements. hortfalls in pension funding are not the exclusive preserve of companies that fail. Many of the largest companies in the US and the UK have seriously underfunded pension systems. In 1999 the S&P; 500 companies boasted a pension surplus of $250 billion. Just four years later this surplus has become a $220 billion deficit. Much of this decline has been caused by tumbling equity prices, but a considerable portion is a result of firms failing to keep up with contributions requirements. Many firms have had to take drastic action to increase the level of pension liquidity. UK retail giant Marks & Spencer recently revealed a shortfall of £585 million between the market value of the assets in its UK pension scheme and the assessment of its liabil-ities. The firm raised £400 million in the bond market to cover the shortfall. Several other firms have taken similar action, including General Motors, which issued the largest capital market financing ever performed—$17.9 billion— last year with the funds being used to cover GM’s near-term pension contribution commitments. Capital market analysts expect further bond issuance to fund pension plan shortfalls, and like some of those already performed, they may be forced to pay over the odds to get the deals done. Businesses are starting to realize that falling behind on pension contributions and thus being forced to borrow funds from the market to cover costs is an expensive proposition. This has led to an across-the-board increase in funding levels over the past year, although many firms are still millions of dollars in the red.To continue with such a situation is dangerous, and many a smaller firm has felt the pressure of funding historical shortfalls. It may yet drive others out of business if things don’t change quickly. While the extent of the problem varies from country to country, the generally accepted solution is to shift the burden of pension provision from the state onto the individual—in some cases through employer-funded schemes. The new plans being devised in Europe draw heavily on the example of the US 401(k) plan.Many aspects of the plans— such as ownership issues, transferability, who should fund them and how to deal with possible problems—bear a striking resemblance to the structure of the 401(k). Opting for a 401(k)-style pensions system may not be the panacea people hope for. Despite all the advancements made in personal pension provision throughout the 1980s and 1990s in the US, there is still a considerable number of people who will be underfunded at retirement. According to the Profit Sharing/ 401(k) Council of America (PSCA), about 60% of the population is eligible for a 401(k) plan, and take-up rates among this group are currently around 75%.This is higher than in many of the European states, partly because the reforms took place earlier than those in Europe.The 401(k) scheme started in 1982 but didn’t become mainstream until the mid-1990s. Target funding rates of these funds is 40%, giving a salary after retirement of 80% of final salary. Nowadays, most people in the US are aware of the importance of retirement funding, the PSCA claims. Although some are currently not saving enough, the situation should continue to improve sufficiently that a “major crisis” will be avoided. 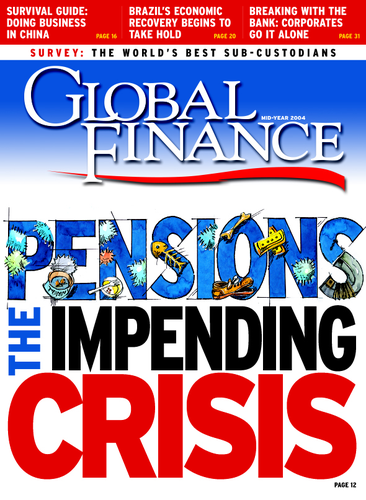 The fact remains, however, that some 20% of the working population has no additional pension schemes and as such will be in serious danger of having insufficient money on retirement.A great reliance is being placed on corporations to encourage the establishment of plans and to drive forward the level of defined contributions savings. Some larger and middle-size businesses are making progress in this area, but many still lag behind. Many firms still have the now-outdated defined benefit schemes where employees pay a percentage of salary into the retirement pool throughout their career at that firm and then receive a pension following retirement. The dangers of these schemes have been highlighted in recent years with a number of prominent corporate bankruptcies leaving many thousands of workers without a pension. The US government has compensated these workers in many cases, although rarely at the same level as they would have received from the firm. Scrutiny of the situation is intense at many multinationals as any change will have a considerable effect on the costs of pension provision for the multinational firms operating within the EU. The current environment makes pension provision considerably more expensive for multinationals than for single-country firms. The different schemes and systems across the region create a great deal of costs for firms with cross-border operations. The European Institution for Occupational Retirement Provision (EIORP) was established to develop the groundwork for multi-jurisdictional fund compliance. This would lead to considerable savings in administration, compliance and governance. It was estimated that a large multinational would save about 0.15% of fund assets. This could be as much as €3 billion across Europe. With considerable tax incentives available, less reliance on old-fashioned and more expensive defined benefit schemes, increased participation rates and improved pension market efficiency, the cost of pension provision per employee for a company is becoming consistently lower. That’s just as well: As more countries reduce state pensions, it is obvious that the corporations and the workers must greatly increase the amount of money they are contributing toward retirement.